It's easy to make a small Yagi for a wireless router even if it lacks an antenna connector. 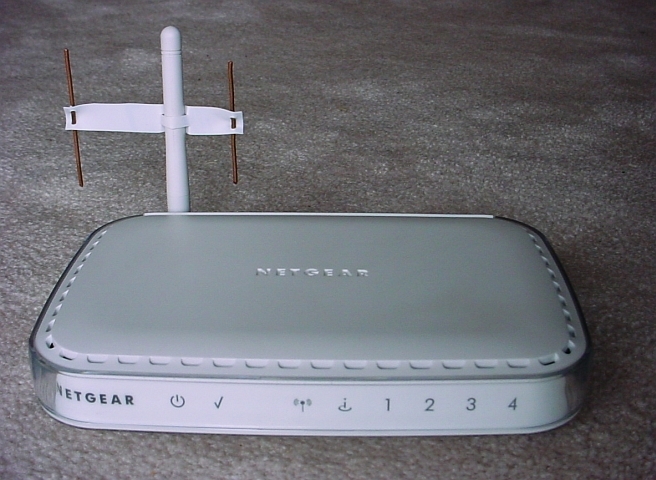 The photo shows how I added two parasitic elements to the sleeve dipole of my Netgear WGR614. The broad forward lobe makes aiming noncritical. The antenna in the photo is aimed to the right. I cut a piece of plastic from a yogurt container top to support the parasitic elements. I folded the plastic and cut slits for the sleeve dipole. Then I drilled holes for the elements, which are made of #14 copper wire. The reflector is 2¼″ long and spaced 19⁄16″ from the center of the sleeve dipole. The director is 2″ long and spaced 15⁄16″. Conductor diameter affects element tuning. If you use unfolded paperclips, lengthen the director to 21⁄16″. The following table shows the change in average performance over 2412, 2437, and 2462 MHz in dB when altering a single dimension by 1⁄32″ (1⁄64″ for ref and dir, which represent element half-length, and 25% for diam). I optimized a five-element Yagi that maintains mechanical balance with two offset reflectors. Forward gain is 2.5 dB greater than for the three-element design. This should increase range 36% or throughput 78%. These improvements may not be worth the additional complexity.